"Unhandled exception : ACCESS_VIOLATION (c0000005)"
I can't start the game, when i launch it without luncher it said : "failed to retrieve process" and when i start with launcher i only have "restart" button. I tryed to re install all in new D2 folders, to delete patchd2 & to re install the launcher (it's the good version). xstormfirex wrote: The session 14 will be played through the downloaded file or should you download something else? Yeah just download it and extract it to the D2 folder and you're good to go. In case it doesn't work, try running the game as admin. There is a timer @ the top right of the website, realm won't restart until then. Anyways, I have been looking forward to this patch and of course I installed it right away after it became available. Things went without a hitch but it seems that I can't create any single player games. 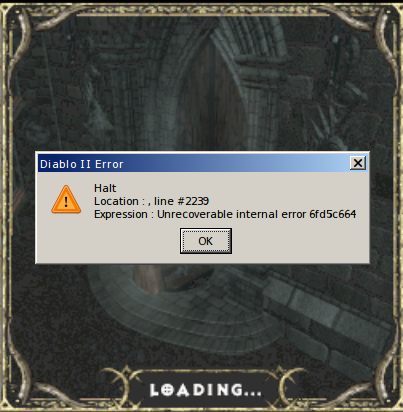 Character creation works fine no issues there but as soon as I want to enter the game i get the following error. I am on Linux Mint 17.1 64bit. The previous versions of MXL worked just fine. Error 2239 has been explained by Marco already in another post.